Gloria is a teenager from Soshanguve near Pretoria, South Africa. She lives in a squatter camp [shanty town] and was making floor polish by mixing solid candle wax and liquid paraffin in a saucepan on the stove. The mixture caught light and spilled over Gloria�s hand. 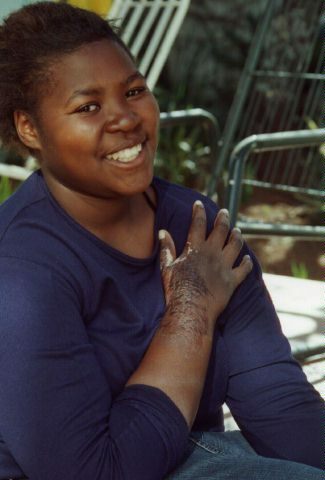 Zanele Jeza (see her section on this website) was also burned when her mother was making floor polish at home, and tipped it over her toddler accidentally.